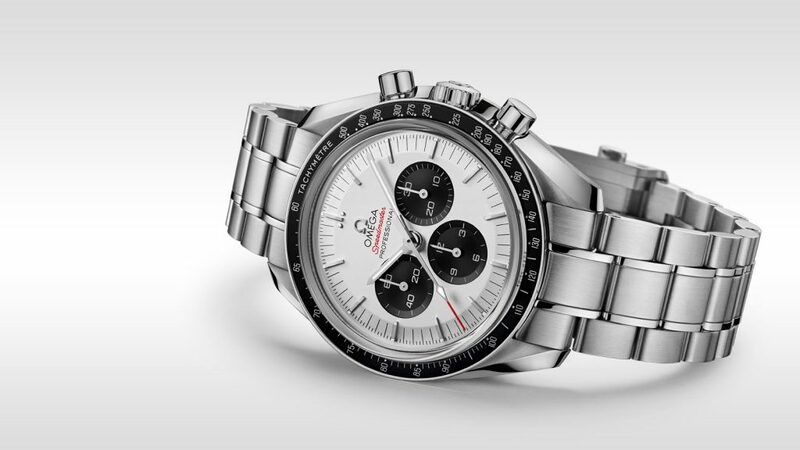 If you can possibly imagine such a thing, Omega has brought out a special edition of its Speedmaster Moonwatch! Now that you’ve had a moment to absorb that, prepare yourself even further. It is actually a collection of five special editions. As part of the brand’s ‘Specialties’ range, the long-time official timekeeper of the modern Olympics has released a quintet of models inspired by the games’ iconic rings. 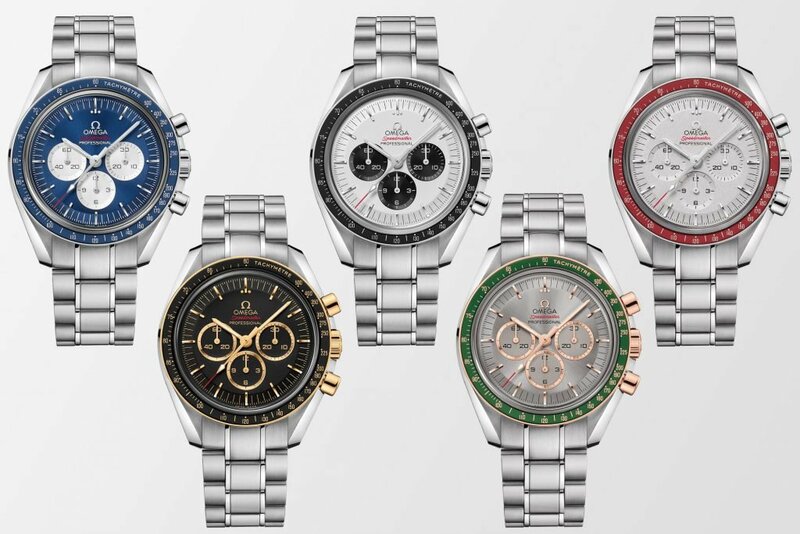 Much as they did with their set of Seamasters to commemorate the 2018 Winter Games in South Korea, they have launched an all-new group of Speedmasters to kick off the countdown to Japan 2020. 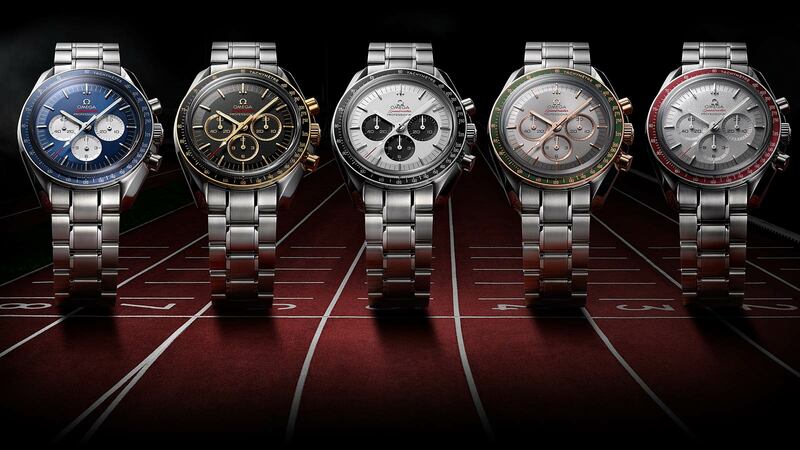 Omega’s association with the Olympics goes back to 1932 when, for the first time, a single company was entrusted with the responsibility of timing the multisport event, held that year in Los Angeles, California. The brand supplied a total of 30 pocket watches with split-seconds functionality, accurate to 1/10th second. Anywhere up to six judges would use separate chronometers to time each athlete, before having their individual measurements added up and averaged out for an official result. It marked the start of an enduring relationship and a series of unprecedented innovations from the manufacturer, providing evermore accurate readings to the world’s top sportsmen and women. Omega can lay claim to developing the electrical photo finish system, and were the first to be able to superimpose an athlete’s running time directly over a live TV picture. In 1968, they invented the touch-sensitive pad for use in swimming events and, in 1984, they brought out the first false start detection equipment, fitted to the starting blocks in track races. The following games, Seoul in 1988, they debuted computerized timekeeping and in 1992 introduced Scan’O’Vision, able to digitally track runners down to 1/1000th second. They have even completely redesigned the traditional starting pistol to ensure each competitor hears the ‘shot’ at exactly the same time. Most recently they have branched out into the field of wearable technologies, with contenders’ clothing and equipment transmitting data live to not only audiences watching at home but to coaches and trainers in order to fine-tune their performance. The recently released collection of Speedmasters take their design cues from the colors on the Olympic flag. Created in 1912 by Baron Pierre de Coubertin, the founder of the International Olympic Committee, the symbol of the games consists of five interlocking rings in, from left to right, blue, yellow, black, green and red, said to represent the union of the five continents. 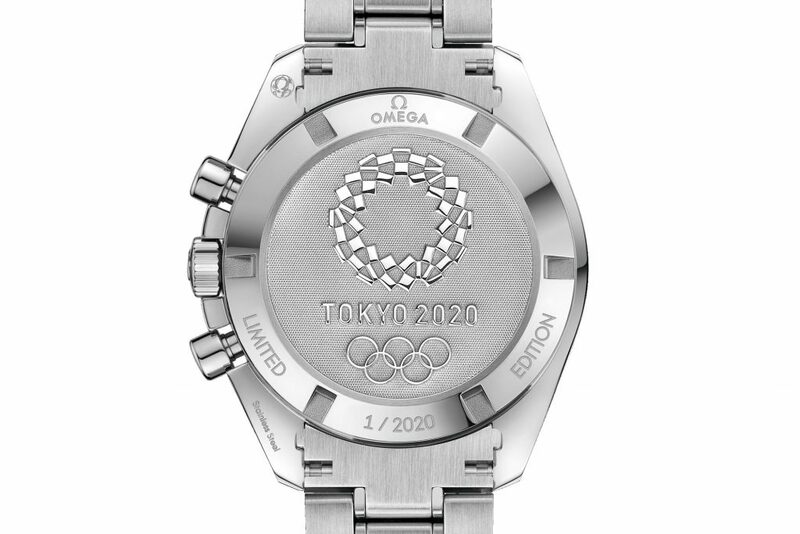 Each one of the watches in Omega’s Tokyo 2020 series includes elements in each specific color. Three of the pieces are forged in stainless steel, while the remainders are two-toned; one in steel and 18k yellow gold, the other with 18k Sedna, the brand’s proprietary rose gold. Color schemes aside, these are the standard-issue Speedys we all know and love, with the 42mm asymmetrical case, fixed tachymetric bezel and manually-winding Omega 1861 chronograph caliber working away at 21,600vph. It is, of course, the exterior that gives each one its personality and the range runs the gamut from the understated monochromatic to the vividly eye-catching. Perhaps the most unassuming, and therefore the most versatile, is the model representing the black ring. Omega have steered away from giving the steel piece an all-black dial, reasoning it would then look just like a standard Moonwatch. Instead, the 522.30.42.30.04.001 is fitted with a panda dial—the face a silvery-white with black sub counters at the 3/6/9, along with a black aluminum bezel, looking very reminiscent of the Apollo 11 35th anniversary edition. This one features more elongated hour markers than that 2004 model and has the Speedmaster name and tip of the chronograph seconds hand picked out in red, as do the rest of the watches in the collection. There is a second panda example in the steel 522.30.42.30.03.001 piece, this time in blue with silver chrono counters. Again, with its brushed dial and coordinated blue bezel, there is a definite throwback to an older, now discontinued limited edition model, the Gemini IV from 2006. The last of the steel watches denotes the red ring and, fortunately, Omega have eschewed the full-colored dial option for something far more sophisticated. The 522.30.42.30.06.001 uses a sandblasted light grey face with silver hour indexes, enclosed by a red surround. It is a similar story with the yellow model, one of the two bi-color pieces and the first time we’ve had a gold and steel Speedy since the Apollo 15 35th anniversary edition, again from 2006. Rather than a bright yellow dial, the brand has instead satisfied itself with a textured matte black version on a steel case, flanked by a yellow gold bezel, crown and pushers. The handset, indexes and stopwatch outer rings are similarly colored, giving the 522.20.42.30.01.001 perhaps the most luxurious air of all the models. And finally, the green bezeled variant is given an unorthodox mix with Sedna gold. The grey brushed dial is accented with red gold hands and sub dials, along with crown and push buttons. Indexes and tachymeter numerals are also filled with the precious metal, making the 522.20.42.30.06.001 as a whole the most colorful piece in the series. There is no doubt these are a desirable group of watches, and ranging in price from around $6115 for the steel pieces to $7,550 for the gold, they are not outrageously priced either. Each one is being produced in 2,020 editions, or there are 55 sets containing all five on offer. The one problem you may have is location. In deference to the Olympic hosts in 2020, the collection is only officially for sale in Japan. 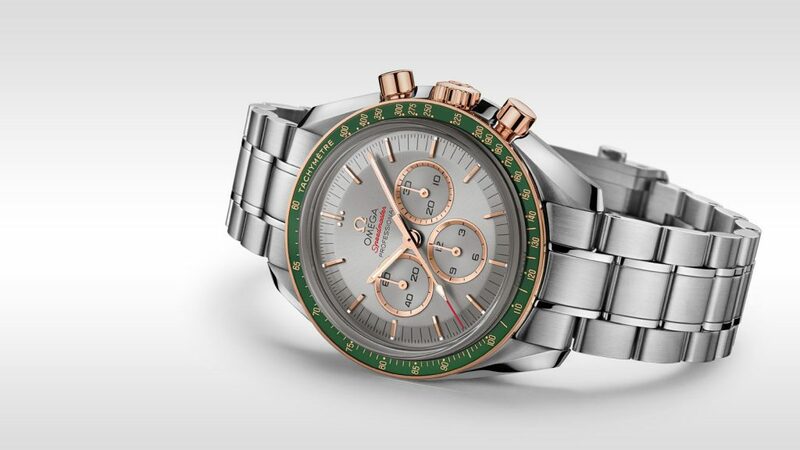 However, it has traditionally taken a lot more than a few thousand miles to stop the Speedmaster’s legions of adoring fans from securing their favorite watch when they really put their minds to it. We wouldn’t be surprised if we saw one or two of these beauties at a meet up over here sometime soon.